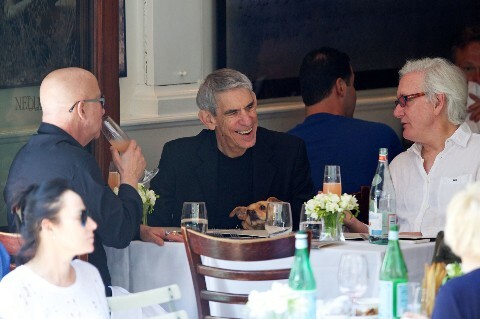 Comic and retired detective from Law & Order: SVU, Richard Belzerpulled a fast one by breaking the law while having lunch at Nello’s withfriends in New York . The TV detective is known for being crazy about his dogs and rarely leaves the house without one of them. He’s active in theNorth Shore Animal League and always urges fellow actors to adopt dogs rather than buy from a breeder. Above, he appears to have a new pet concealed on his lap in the restaurant and we all know that’s against the law! But we wish it wasn’t.